See more objects with the tag religious, clouds, waves, temple, worship, bats, dragons, auspicious symbols. See more objects with the color darkkhaki midnightblue rosybrown dimgrey dimgrey or see all the colors for this object. This is a Robe for a statue. It is dated late 18th century and we acquired it in 1960. 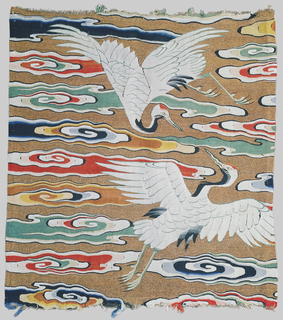 Its medium is silk, metallic and its technique is plain weave with discontinuous wefts (slit tapestry). It is a part of the Textiles department. This tiny late 18th century dragon was most likely used to clothe a deity figure in a Daoist temple. 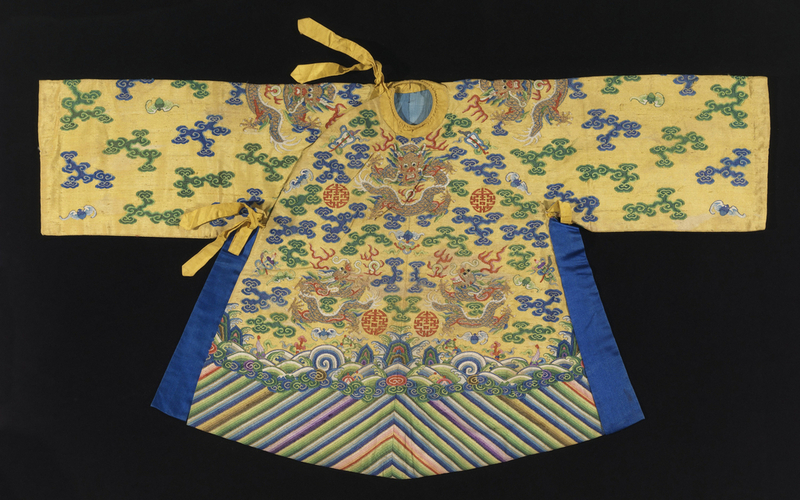 The 5-clawed dragon and bright yellow color were symbols of the Emperor, indicating that this robe was either an imperial donation to a temple, or was used to clothe a statue of a legendary emperor. Dragon robes originated in the Liao dynasty (907-1125) and continued to be worn until the late Qing (1644-1911). The robe features dragon medallions surrounded by blue and green clouds, flaming pearls, bats and other auspicious symbols. The pattern scheme and motifs on this example indicate that it dates to the late Qing (1644 -1911). This object was featured in our Object of the Day series in a post titled The Dragon's Allure. This object was purchased from Edna Bahr and fund: Au Panier Fleuri Fund. It is credited Museum purchase from Au Panier Fleuri Fund.